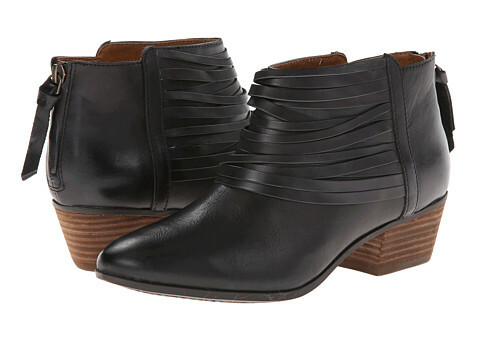 I finally picked a pair of ankle boots and I want to wear them all the time now. They are these, the Clarks Spye Celeste. I really like them. They have a low heel, which is perfect for me. I'm tall so I don't feel like I need extra height, plus I find heels to be very, very uncomfortable. I have no idea how women walk in high heels! They have an almond-shaped toe, so they're not pinchy. And they have some fringe on the front that I love! Now that spot in my capsule is filled. I have one more empty spot, for a black & white striped dress or tunic that I'm sewing. Think I'll finish it in time to wear it before I move on to my winter capsule? I hope so! I think it's going to be pretty cute.